As they do every year, the National Hockey League and Fenn/M&S had prepared all spring for a quick-to-market book about the 2011 Stanley Cup champions. A couple of weeks after the Boston Bruins won the Stanley Cup, they released The Year of the Bruins. Of course, the editors had to be equally prepared for the eventuality that the Vancouver Canucks had won the Cup. Using the same template and format, they prepared just such a book. They even made the mistake of releasing the cover and listing it online. Take a look. That book never made it to market, needless to say. 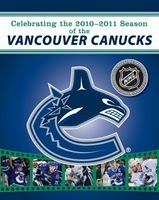 But after having the book prepared minus the storybook ending, the NHL and publishers decided to cash in on the Canadian marketplace and release the book as Celebrating the 2010-2011 Season of the Vancouver Canucks . That's nice of the, although I'm sure every Vancouver Canucks fan would tell you they would much rather have seen the book that was never released. Essentially the book that was ultimately released was an obvious cash grab. Other than self-imposed time constraints, it was unnecessary to release the book so quickly. They should have taken the time to at least change up the look and format so that it was not so obviously the book Canucks fans almost had. Take the time to change it up a bit and offer Canucks fans something a bit different. It's bad enough that Canucks fans never got the book they really wanted in the first place. This rushed book only reminds them of that.